Owners/ Municipalities | Ric-Man International, Inc.
"This work was complete under the three million dollar budget and completed in two months time. This was one month ahead of a very tight schedule imposed by FDOT. 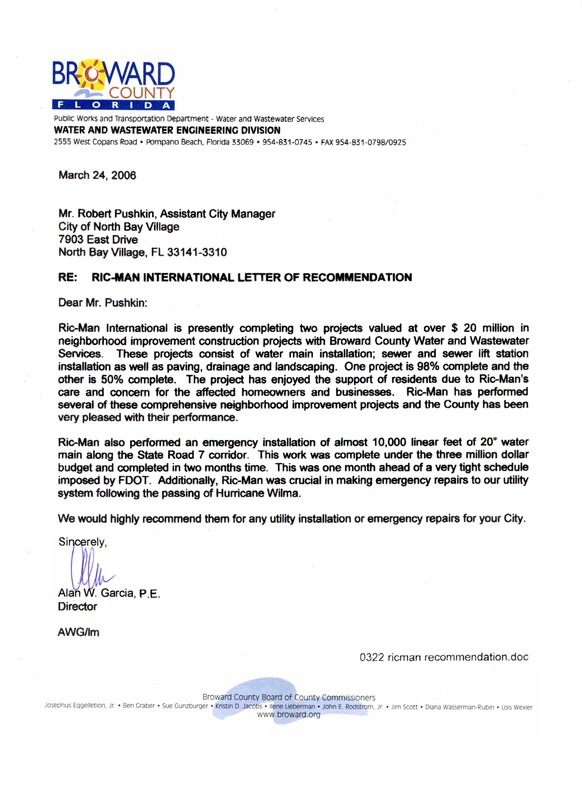 Additionally, Ric-Man was crucial in making emergency repairs to our utility system following the passing of Hurricane Wilma." 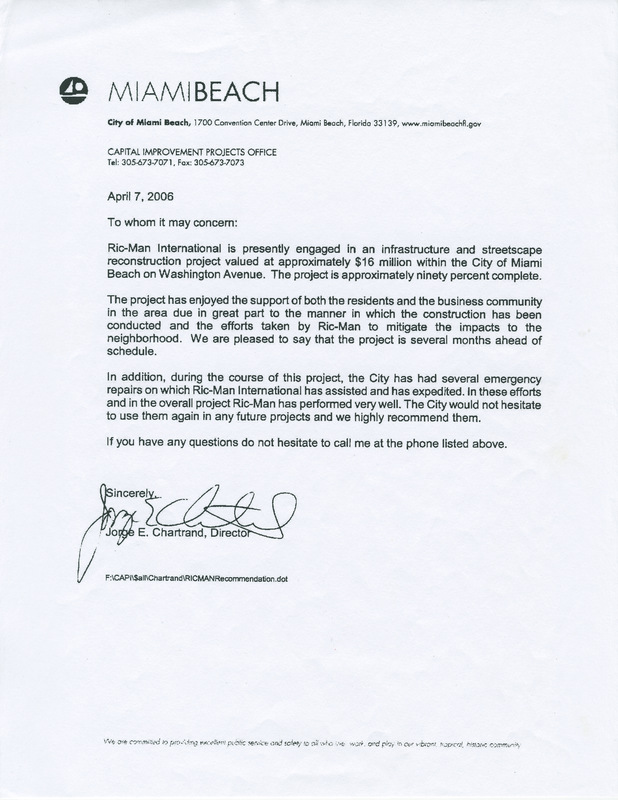 "The project has enjoyed the support of both the residents and the business community in the area due in great part to the manner in which the construction has been conducted and the efforts taken by Ric-Man to mitigate the impacts to the neighborhood." " I plan to work with them on future Neighborhood Improvement projects and highly recommend them." 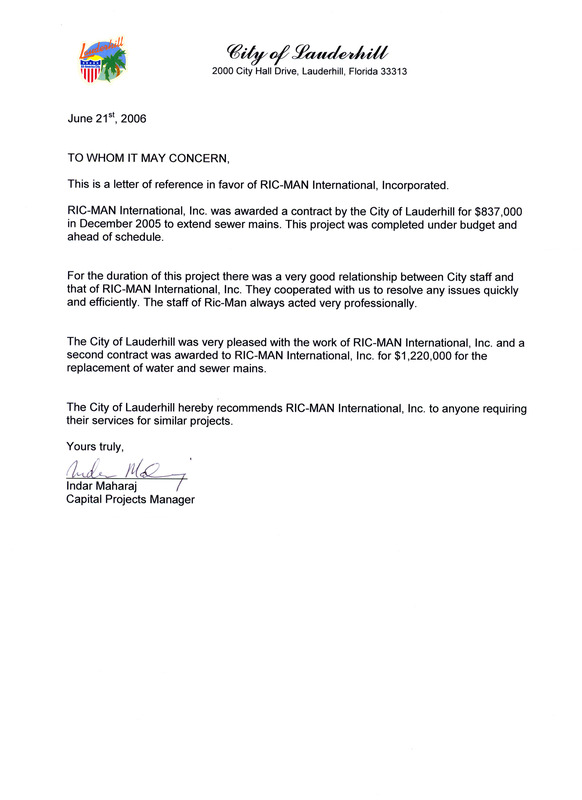 "The City of Lauderhill was very pleased with the work of RIC-MAN International, Inc. and a second contract was awarded to RIC-MAN International, Inc. for $1,220,000 for the replacement of water and sewer mains." "Their integrity and productivity is well above average...Their personnel are very well experienced in underground utilities and roadway construction. They have also performed especially well at directional drilling, pump stations, subaqueous crossings, and aerial crossings." 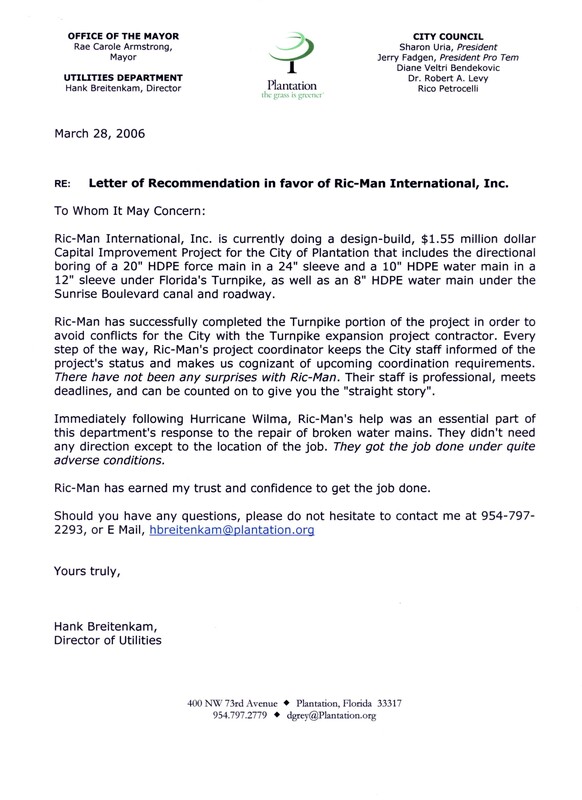 "I am delighted and privileged to write this letter of recommendation for Ric-Man International, inc. I have been working with Rene Castillo General Manager for over 18 years... Specializes in neighborhood improvements projects, consisting of drainage, water and sewer including pump stations, directional drilling and sub-aqueous crossings as well as roadways, concrete work, and landscaping." "Their teamwork in cooperation with our staff were the key elements in completing this project, 50 days, ahead of schedule and within budget." "Ric-Man has earned my trust and confidence to get the job done."